Everyone agreed that this day was “verry warm” and that rain was needed. * Evelina, looking up from her sewing, reported that they had “quite a heavy shower.” Her father-in-law, however, described the rain as “a small shower in the forenoon about an eighth of an inch.” Her glass was half-full, his was half-empty when it came to considering the benefit bestowed by this particular rainfall. Such quick rain wouldn’t have been enough to interfere with the building of the new stone shops at the factory. Workers had begun to arrive on Saturday and, surely, some initial construction was already underway. Old Oliver would have made sure of that. This first building on the new site, which was much closer to where the Ames family lived, was dubbed the Long Shop. Industrial historian Greg Galer describes the Long Shop as “a simple, narrow, gable-roofed, two story building 525 feet long and 35 feet wide with a 60 by 50 foot ell and an additional 30 by 10 foot engine house. “** This sturdy, less flammable facility would be up and running by the end of the year, and soon include a 60 hp steam engine. 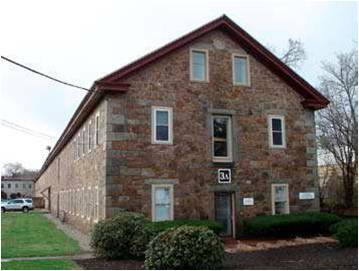 Residents of North Easton today know the Long Shop as one of several shovel factory buildings repurposed for residential use. Along with others, Mr. Galer was instrumental in the successful effort to preserve the historic character of the Long Shop as the site was developed.